We are a family friendly camp suited to those with older and more independent children. Although we are not exclusive in this regard. We enjoy a quieter part of Blazing Swans camp grounds for successful sleeps and our kids are very active in helping and contributing to our pancake gifting...and running a pancake tent from 9 until 11 each morning of the festival for anyone to come and enjoy a pancake breakfast! There is also a giant two room (girl/boys), 'kids dorm' tent for the tweens and teens to share and enjoy their nights in each others company. 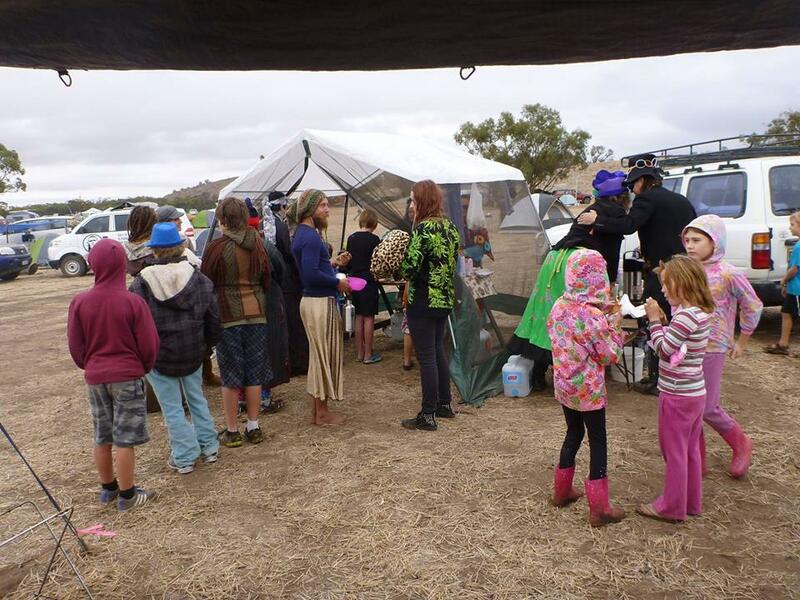 2014 and 2015 saw the kids have a blast cooking up mountains of sugary, lemony pancakes and handing them around to the hungry and scruffy hordes who came up for the only pancake breakfast camp at Blaze, SPKK has been a huge hit and we anticipate our hub only growing over time. To create the steampunk ambience; costumes around the clock, art installations and thematic tent/camp decorations are all ecstatically welcomed! To celebrate their Steampunkery, Steampunk Kamp also threw their first Blazing Swan Steampunk ball in 2015, joining the KoAsis crew in their funky surrounds. Donations for spirit bar encouraged and very welcomed.. and another night of mayhem is sure to ensue. Strangers are welcomed and old friends embraced. A theme camp suited to a particular demographic- families with older, independent children who can and want to be involved in the magic of very actively gifting to the festival. A quieter area for families to camp and get good sleeps. A communal camp within the festivals community where we all help each other create a wonderful breakfast feast, feasting area and a fun camp for young adults. To have a yearly ball loosely celebrating the camps core theme 'Steampunk' with gifting of drinks and prizes; an event separate to the pancake gifting.